Chia seed pudding is one of the first recipes I posted on this blog. H and I both love it, and I love the convenience of it when served for breakfast. I always make it the night before and it is ready to go in the morning. It is so easy to make and requires no cooking. I started giving my little guy chia seed pudding when he was about 6 months old. I originally discovered the recipe on ‘A Healthy Mum‘ – a food blog with healthy recipes and tips, and I have been making it ever since. I have used coconut milk in this version and combined it with berries for a healthy breakfast, snack or dessert. You can find the original recipe here. Add the milk to a mason jar or a container with a lid. Add the chia seeds and vanilla extract, secure the lid and shake straight away so the chia seeds don't clump together. Add the mashed berries and shake again. Give it a few more shakes over the next 15 minutes, so the mixture thickens evenly. Leave in the fridge for a few hours or make the night before. This looks so yummy. I tried chia pudding for the first time recently and it was delicious! Now I need to make it at home, and this looks like the perfect recipe to start with. I have seen this recipe floating around the web but have never tried it. I’m totally convinced now, your photos are gorgeous. Looks like H is being fed nutritious healthy food from a super young age! YUM! He is my little gourmand – he would rather a bowl of peas or fruit over lollies and chocolate – winning!! 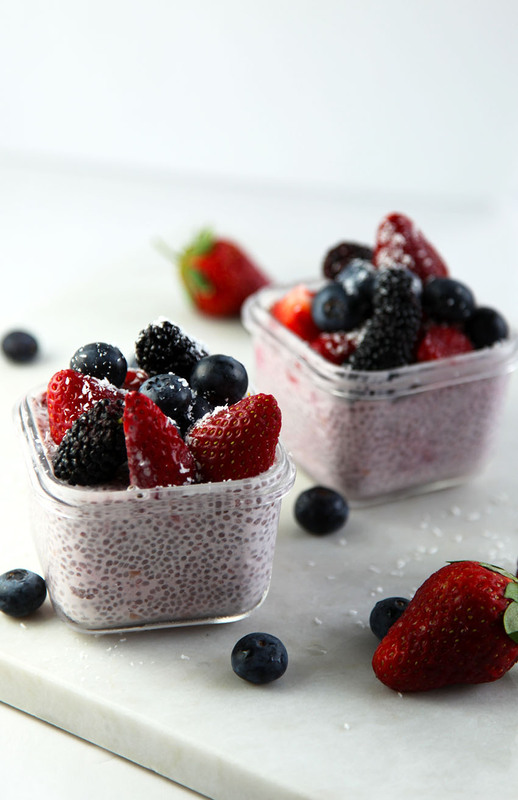 Love Chia Puddings! I discovered them about a year ago and just love them and find they are perfect for breakfast. Thanks for sharing this recipe. Simple and healthy breakfast. I love this recipe and the photographs are so beautiful! Pinned and Yummed!!! Healthy indeed! And tasty! I’d love this for breakfast. Your little guy probably thrives on this breakfast! I’m a big fan of chia seed pudding too. So easy to make yet so satisfying, not to mention good for you! Chia seeds are always so pretty in this sort of dessert. This looks delicious! I just bought chia seeds for the first time and I think I know now what I’m going to do with them :) Thanks for sharing!